Vinna: To begin, what first drew you both to the world of publishing? Vinna: In the seven short years that Scarlet Imprint has been publishing you have managed to claim a spot as one of the foremost occult publishers in the world. What would you say is the driving force behind your rapid success? Scarlet Imprint: A lot of hard work! We love what we do - books have been so important to us - as somewhat eccentric individuals - from a young age, and that love speaks to people. We had a very clear vision of what we wanted to realise with Scarlet Imprint: work which is spirit-based and practitioner-led, without sacrificing intellectual rigour or discrimination, and manifested with artistry. We are inspired as much by the traditional book arts as by the artistic avant-garde, and of course the foundation for our vision and drive is our own magical practice and conversations with spirits, our personal eschatology. Above all, we have been blessed to work with some of the most interesting and original writers of the modern occult, whose works have helped to materialize and progress the vision we had initially. It is fair to say that Scarlet Imprint is very much a collaborative endeavour - what we have done is a result of the writers and artists we've worked with and the support we've received from our readers and peers. The printed material is really the tip of an iceberg: it betrays the hidden reality of correspondences and friendships, and the magical and artistic work being done. Vinna: Your books are, without question, some of the most beautifully bound editions available on the market at this time. I'm sure with such quality material there must be a great demand for your hardcover editions. Is there a particular reason the hardcover editions are limited printings? Scarlet Imprint: Thank you! We work with the best binders and printers in the UK, and pay very close attention to the details and the execution. We consider the book a magical object in its own right, so with each title it is a question of beginning again - from a blank page, so to speak. All elements of the design spring from that first encounter with the text, and the contact with the numen or spirit of the work. The limitations of the hardback runs are the result of both magical and practical considerations. The actual readership for specialist books on magic and witchcraft is very select; the internet distorts the real size of the community, and it does with many other aspects of our lives. As a small, independent publisher, we are committed to bringing out the most radical voices of the time as well as specialist texts which presuppose conversance with the principles of ritual and spellcraft. (These generally aren't entry-level books, although beginners would, I believe, gain much from examining and putting into practice the spellcraft and ritual procedures outlined by Nicholaj de Mattos Frisvold in his works on Brazilian sorcery, for instance. Competence and mastery are the result of need, and persistence.) The limited runs are reflective of the actual need or demand for specialist, practitioner works within the wider pagan and occult milieu. We are also bound by ethical and economic considerations: we avoid the mass-produced horror of the corporate book industry with its devaluing and dehumanising of labour, skill and expertise in the book arts, and the concomitant reduction of the material presence of the book to a mere simulacrum that falls apart in the hands on the first read. Moreover, whilst our hardbacks and fine editions are limited, we make sure we print enough copies to remain in stock for a number of years; and we also issue our titles in paperback and digital editions, so that the work remains in print and accessible. It is also important to us that the books reach serious students, regardless of their income or personal circumstances. I should also point out that the hardback editions enable us to produce the paperbacks, that without the ongoing support of our readers we would not be able to bring out these works. Vinna: What influence, if any, do your personal magical practices have over your work at Scarlet Imprint? Scarlet Imprint: Almost every aspect of our work is informed by our practice, the creation of these talismans cannot be separated from our magical work. Each step of the process is guided by divination, skrying, astrological considerations, the law of sympathies and the demands of the spirit of the book. In fact, every book can be considered a spell unto itself. Immediately following the publication of the first edition of The Red Goddess, the spirits of the Goetia manifested, unbidden, in our appartment. This led to our working with them, and prompted the anthology Howlings, our second title. The deepening relationships with these spirits continues to play a role in what we do. Finally, our magical practices are intimately entwined with our artistic expressions - whether writing, dance, painting - and Scarlet Imprint has emerged from this conjunction. There is an imperative to actively create. It's an act of enchantment ... creating and participating in culture, rather than being ghettoized or passive consumers of the mainstream mono-culture. We have joked that we are the under-undergound, working in that obscure chthonic substratum that sometimes eventually comes to light, sometimes remains hidden whilst other flowers bloom. Vinna: Over the past several years have you noticed any marked trends emerging within the occult/Pagan publishing world? Scarlet Imprint: There has been something of a gold rush in occult publishing, prompted by the ability to reach a global readership via the internet combined with developments in the print industry and the democratising effect of desktop publishing software. It is a double-edged sword, for just as this expansion has enabled a number of new voices to find a platform, much of what has been produced will be judged to have no lasting value. The bubble of artificially high prices on the secondhand market, which speculated on limited fine editions, is now bursting, and I imagine there will be a new, more sober, equilibrium established in the aftermath. Another observation would be the effect of the academy and academic research on practitioners, both in terms of magical practice and identity. Vinna: As we evolve as an occult/Pagan community it stands to reason that our occult/Pagan publishers evolve with us. What evolution do you feel is necessary for the occult/Pagan publishers if they are to remain relevant? We suspect that the large publishers will fail, that is, be crushed by Amazon, and more people will discover the beauty of small, bespoke presses and imprints and the joy of well-made traditional books. Vinna: What books or projects are currently in the future for Scarlet Imprint? Scarlet Imprint: We keep most future projects sub rosa, but we can confirm that there is an essay collection The Brazen Vessel in progress. This gathers together a wide range of our writings on witchcraft, magic et al. We have several other titles at various stages of production, which you can find out about first if you drop us an email and join our subscriber list. Vinna Finally, what books are you both currently reading? Scarlet Imprint: Cecil Williamson’s Book of Witchcraft by Steve Patterson, The Cunning Man’s Handbook by Jim Baker, The Origin’s of the World’s Mythologies by E.J. Michael Witzel, and The Gardens of Adonis by Marcel Detienne. That is personal reading outside of our research interests, which would include a stack of about twenty or thirty titles each! There is also a selection of other titles we dip into, we like to read to each other - poetry or passages from books - late at night. I hope you have enjoyed the interview and found Peter Grey and Alkistis Dimech as fascinating as I do. 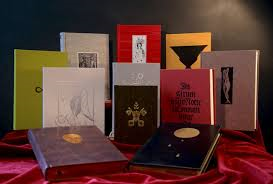 If you would like to purchase any of Scarlet Imprint's titles they can be found at their website: http://scarletimprint.com/ . I would personally recommend Apocalyptic Witchcraft, Mandragora, and Serpent Songs. Keep an eye out Rioters, Scarlet Imprint is publishing some of the most rewarding books on the Pagan market right now and they are worth your attention. fight for your case to set you free.